What was Jean-Paul Sartre’s version of existentialism? Sartre was an atheist, so he began with the premise that man is alone in the world and there is no higher power. There is no fixed human nature because man is the inventor of the very idea of nature: “man makes himself.” This ability to make oneself is accompanied by a responsibility for what one makes and it leads to considerable anguish because one must choose what to be on one’s own. The living human being is always in a situation of varying degrees of difficulty from which there is no escape. Others are also present in one’s life, of course, and they have the same kind of freedoms you do, which renders cooperative and lastingly loving human relationships extremely difficult. One can never fully see the other as he or she is to himself or herself. Because others are in the same situation, the net effect is that “hell is other people.” Sartre’s view of intimate relationships was bleak because the person desired always eludes being the object desired. The desired person can never fully become an object because he or she has their own freedom. To accept one’s freedom and one’s situation, or “facticity,” are both necessary in order to be in “good faith.” The person who lives in bad faith either denies his own freedom and responsibility or denies the reality of his situation. Everything is chosen, even emotions that carry one to extremes, or insanity. Even the most difficult situation, which one has not chosen, does not negate one’s freedom. It is the individual who gives the situation the meaning it has for him or her as a difficult situation. With a gun to one’s head, for instance, one still has the choice of whether or not to live. 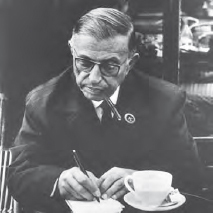 Jean-Paul Sartre was the icon of twentieth century existentialism (Art Archive).